BP '58 - '89 Shield & Chequered Flag No Yellow Border Stickers. 6" Pair. BP '58 - '89 Shield & Chequered Flag with White Border Stickers. 12" Pair. BP '58 - '89 Shield & Chequered Flag with White Border Stickers. 4", 6", or 8" Pair. BP '58 - '89 Shield & Chequered Flag with Yellow Border Stickers. 9.5" Pair. BP '58 - '89 Shield & Chequered Flag with Yellow Border Stickers. Various Sizes. BP '58 - '89 Shield with No Yellow Border Large Sticker. 10" or 12". BP '58 - '89 Shield with No Yellow Border Stickers. 4" or 6" Pair. BP '58 - '89 Shield with Yellow Border Sticker. 10" or 12". BP '58 - '89 Shield with Yellow Border Sticker. 8". BP '58 - '89 Shield with Yellow Border Stickers. 2", 3", 4" or 6" Pair. BP '89 & On Coloured Shield Stickers. 2", 2.5", 3", 4" or 6" Pairs. BP '89 & On No Border Shield Large Sticker. 10". BP '89 & On Shield Large Sticker. 8". BP '89 & On Shield Large Sticker. 9", 10" or 12". BP 'Please Service At ...' Service Sticker. 3". BP 'V' Super Visco-static Oil Can Stickers. 3.5" or 6" Pair. BP 58 - 89 Style Oblong Stickers. Set of 4. 50mm. BP Black & Beige Shield in Beige Square Stickers. 3" Pair. BP Black & Beige Shield Shaped Stickers. 3" Pair. BP Black & Silver Shield Stickers. 4" Pair. BP Black & White Shield in White Square Stickers. 3", 4" or 7" Pair. BP Black & White Shield Stickers. 6" Pair. BP Black & White Shield Stickers. Set of 4 1.5". 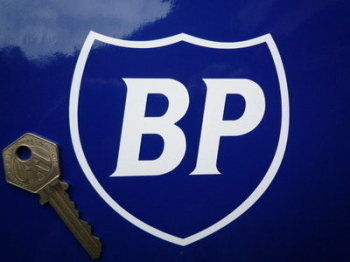 BP Coachline Shield Sticker. 8" . BP Cut Vinyl Shield Sticker. 4", 6" or 8". BP Energic Vertical Cut Text Petrol Pump Sticker. 20". BP Energol Horizontal Cut Text Petrol Pump Sticker. 10". BP Energol Motor Oil Large Workshop Sticker. 22". BP Energol Small Oblong Sticker. 3.25". 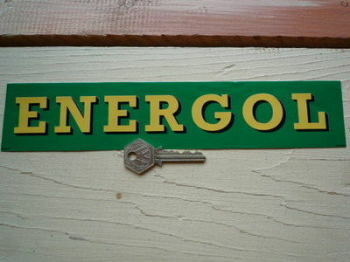 BP Energol Two Stroke Oblong Can Label Sticker. 11". BP Energol Vertical Cut Text Petrol Pump Sticker. 12". BP Ethyl Square Sticker. 9" or 12". BP Green & Yellow 90's Style Handed Oblong Stickers. 10" Pair. BP Green & Yellow 90's Style Shield in Square Sticker. 8".